Coffin board (棺材板 'guan chai bun') is a popular snack from Taiwan. When I first heard of this recipe, I was intrigued by its unusual name wondering how superstitious Chinese can be and how many people can get offended by its name. Coffin board resembles American's chowder filled bread bowl. Instead of crusty bread, coffin board uses fried bread similar to English fried bread but much larger chunk. The filling is also western with meat/vegetable mixed with a basic roux bechamel sauce. Not sure how this recipe was invented, I know it is from Tainan, Taiwan. I believed this was invented by some street food vendor, the original recipe used chicken liver as filling now anything goes. This recipe is really a take on Western taste than Chinese. I reckon this probably comes from a huge Taiwanese immigrant population in USA and bringing back chowder filled bread recipe and adopted from it. For the filling anything you like, prawns, crab meat, chicken, chicken liver and vegetables like carrot, peas, onion, sweet pepper, sweet corn, button mushrooms etc...in a white sauce. I am sure any creamy chowder is good for this. ** For vegetarian version just use any vegetables or even add tofu pieces if you like. I am not one favour east meets west recipes much. The Taiwanese has triumphed with this recipe. It really is delicious. I am sure this will be a great hit for Halloween, especially if the bread is cut into real coffin shape. Here is what I do, recipe for one. Enough for one full meal. 1 block of stale bread, white or wholemeal, homemade or bought, cut into square, rectangular or any shape you like. I preferred a very thick slice about 7 - 8 cm thick which can hold more filling. enough oil for shallow or deep frying or a little melted butter for brushing the bread if baking. I like the baking method better. Make the bechamel sauce. First cook the flour and butter together for about 1 minute then heat off add milk a little at a time and whisking till no lumps. Heat the sauce till thicken. Set aside. The bread is normally deep fried or shallow fried till golden. I changed this by brushing the bread with melted butter and bake at around 200 deg C for about 15 minutes, turning the bread once or twice till all sides are golden brown. Let the bread cool a bit, then cut out one side for the lid. Scope out enough of the soft bread inside then trim the lid. Then fill with the creamy filling and garnish. Put the lid on top or on the side. One delicious filled coffin board is ready to enjoy. * Can use the bread trimmings for bread pudding or breadcrumbs for other uses. I live in Tainan City, Taiwan and this dish is wonderful! They are popularly seen at the various Night Markets in the city and throughout Taiwan. I LIKE this recipe and its spot ON to how its made here. I've sent it on to my mother in St. Petersburg, FL. I'm in LOVE with this site. Mmm~ It looks great! Gonna give it a shot! Tainan used to be home to an American Air Force base. The recipe was created by local vendors to sell to the men stationed there. It became associated with Tainan and that is the only place in Taiwan I could find it. 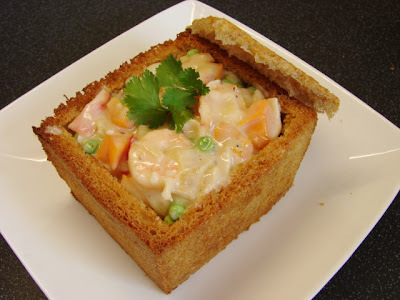 Its similar to seafood pot pie.